About Stephanie Clergé, our keynote speaker. 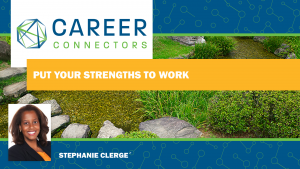 Stephanie is a consultant, coach, trainer, and holds the title of Director of Training and Consulting at Kolbe Corp, an HR Consulting firm specializing in assessments and interventions that increase individual and collective performance. She holds an Industrial Engineering degree from Stanford University and an MBA from Babson College with a focus on corporate entrepreneurship and completed a Coaching Certification from the Hudson Institute of Coaching. Stephanie has spent nearly 15 years managing teams and developing leaders at Intel Corporation. Stephanie challenged us with a question we hear often, “What do you want to do when you grow up?”. Sometimes we feel we know the complete answer but end up experiencing burn out. Have you been in a position where you’ve felt absolutely de-energized? Does the thought of your current or past position bring knots to your stomach? It’s a great opportunity to dig and find a better way to experience your career. Begin by getting to really know yourself, starting with a determined honesty in your reflection. What things do you do well? What’s your natural ability? What’s your unique flair? What gives you energy? You can be great at something, but does it give you energy? For instance, how does organizing your garage make you feel? Maybe you’re great at it, but while doing it are you receiving energy? On the other hand, what are you good at but don’t think of doing in your downtime? Maybe you’re great with spreadsheets, or documenting data but never consider that as one of the Top 10 fun things to do. Why Strengths? The benefits of enhancing your strengths is higher performance, less stress, more engagement, more energy, more resiliency, more confidence. Employees who focus on their strengths are 6x more likely to be successful in their roles. 1. Write your signature with your dominant hand. 2. Now write it with your other hand. What did you notice about writing with the dominant hand? Probably not much because it was natural, easy, fast, and comfortable. Writing your signature with the non-dominant hand was probably awkward, slow, sloppy and took more time. Look for your underlying patterns of thought. How do you find strengths? What’s easiest, energizing, and efficient for you? You can review your skills, grades and manager reviews. Or how do you feel when given projects and tasks? Are you motivated, interested? What are your preferences? How do your values affect your decisions? Think about a job you loved. What did you love, the environment, the people, the dynamics? What do you need from your manager? Does the industry matter? Now that you’ve invested in defining your strengths, it’s time to develop your tools. What does your resume tell about you? Does your resume match what you said or what you’re applying for? What is your contribution (quantifiable)? What ever happened to the Cover Letter? Newsflash: if you’re not submitting a cover letter, you’re losing a significant opportunity. This is where you can really share what you want, why you want it, and stand out! It’s where you can captivate your audience and control your overall message. This is a great place to provide context, especially if needed for questionable areas such as long periods of unemployment. It is a recruiter’s lens. Many recruiters will not look any further if you do not have a LinkedIn profile. What are they looking for? Obtain well written recommendations from the right people. If you are wanting to manage people, a friend’s recommendation that says you’re “an awesome person”, has nothing substantive in conveying to others what you want to do in your next management position. List contact mail and answer mail promptly. Follow and be active in groups relevant to your future position. So your strategic path has reaped employer interest and now it’s interview time. Have your notepad loaded beforehand with your questions. This shows strengths in action. Be ready to share your contributions. What are the growth opportunities? Have 5 to 10 questions prepared. This shows you have critical thinking ability. Ask strategic questions to get them to ask you about something you want to share. In conclusion, it’s crucial to know your strengths and be ready to build upon them. Now you can take the next steps and soar! The Infusionsoft Mission is to help small businesses succeed. They are looking for employees that play well with others, leave their ego at the door and contribute in a team environment. Infusionsoft currently has ~60 openings, including positions in the following areas: Engineering, Marketing, Finance, Accounting & Analytics, Sales, Customer Success, and Operations. Perks & Benefits include health and dental insurance, stock options, flexible time off, snacks, drinks and more! Mike emphasizes the importance of starting your education now. From there you can build on knowledge, maximize opportunities, and connect your knowledge to career opportunities. In the process, one gains multiple achievements.